Elevation Gain: 3,400 depending ft. Follow the buffalo cabin trail NW until you come to a trail junction. Descend NW for 200 or 300 ft towards the S. Willow Creek drainage. Traverse west for about a mile around the NE side of the mountain until you're at the bottom of the couloir. Booting up the Silver may require an axe and crampons. Nearly 3000' of skiing awaits those who put in the effort to climb to the top!!! 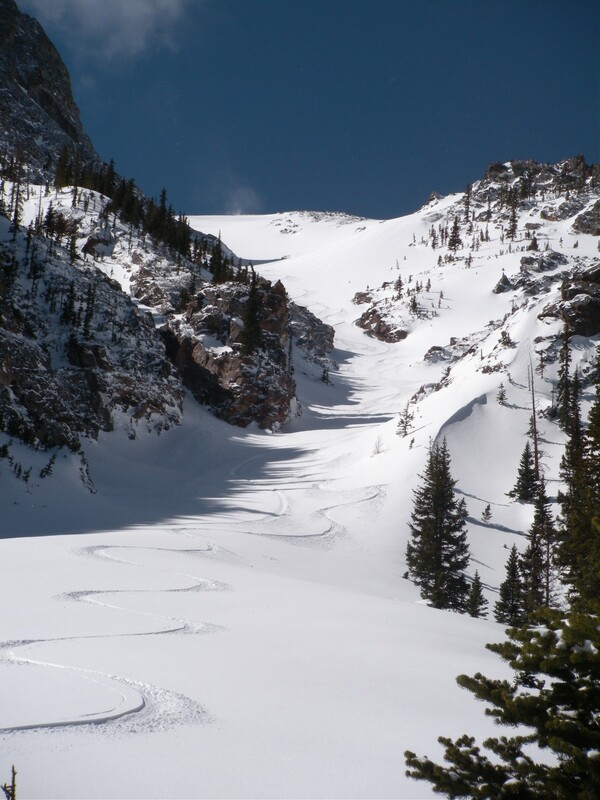 The Silver couloir has been regarded by several (Lou Dawson - Wild Snow, Chris Davenport - 50 Classic Ski Descents of N. America) as one of N. America's classic lines. I have to say I agree. The couloir is very wide (narrow section is 50 feet?? ), moderately steep at around 40 degrees, and LONG!! !